How Important is it to Know the True Nature of God? How important is it to know the true nature of God? Many Christians are okay with accepting that the “trinity” is a “mystery”, and letting it go at that. But what did Jesus say? If our “life eternal” is at stake, is it okay to just leave the nature of God and Jesus a “mystery”? Not for me! Joseph Smith’s First Vision when he saw God the Father and God the Son did more damage to the “orthodox” doctrine of the Trinity than anything else since Stephen’s vision in the New Testament. “but he (Stephen), being full of the Holy Ghost, looked up steadfastly into heaven, and saw the glory of God, and Jesus standing on the right hand of God. And said, behold I see the heavens opened, and the Son of man standing on the right hand of God” Acts. 7:55-56 31 A.D. When the light rested upon me I saw two Personages whose brightness and glory defy all description, standing above me in the air. One of them spake unto me, calling me by name and said, pointing to the other – “This is My Beloved Son, hear Him.” Joseph Smith History 1832 A.D.
Now that seems pretty “orthodox”, doesn’t it? Just like the New Testament Saints, Mormons believe that the Father is God, the Son is God, and the Holy Ghost is God. In fact, when I was baptized at the age of eight in the little LDS chapel in Columbus, Georgia, my baptism was performed “in the name of the Father, and of the Son, and of the Holy Ghost.” The same was said when I was married in the Salt Lake Temple to my beautiful bride. That’s three persons in the Godhead, right? And yet like the apostle Paul, we as Latter-day Saints “worship the One God, the Father of our Lord Jesus Christ” (1 Cor. 8:6). So then why all the fuss? One God, three Persons. Don’t the LDS believe in the Trinity then, just like other Christians? Now let’s see what the critics say outside The Church of Jesus Christ of Latter-day Saints who delight in calling us a “non- Christian cult” because we don’t accept the exact “three-in-one” concept of the Godhead that is promulgated in the major creeds of historical Christendom. The Trinitarian formula seems to be their favorite “litmus test” to see who fits their definition of a Christian. The orthodox consensus of the Christian church is defined in terms of its historic creeds and doctrinal affirmations. … the church has used these definitional doctrines as the standard for identifying true Christianity. The Mormon doctrine of God does not correspond to the Christian doctrine of the Trinity. Mormonism rejects the central logic of this doctrine (one God in three eternal persons) and develops its own doctrine of God – a doctrine that bears practically no resemblance to Trinitarian theology. … Normative Christianity is defined by the Apostles Creed, the Nicene Creed, and the other formulas of the doctrinal consensus. And yet this “normative Christianity” is still arguing over what the Trinity really means after almost two thousand years! Even the above-mentioned creeds have been debated and revised time after time over the centuries by one church council after another. The so-called “central logic” of the doctrine of the Trinity is not logic at all, but a blind acceptance of the fuzzy thinking by religious philosophers that originated back before medieval doctors used leeches to treat sicknesses. “the formulation of “one God in three Persons’ was not solidly established, certainly not fully assimilated into Christian life and its profession of faith, prior to the end of the 4th century. . . .
From the conversations I’ve had, it seems that a lot of Christians resolve the “mystery” of the Trinity in their own minds by falling into the old heresy of Sabellianism, also known as “Modalism” – the notion that there is really only one being called God who is manifested at different times in the “mode” of either the Father, the Son, or the Holy Ghost. Sabellius was a theologian and priest from the third century who taught that God put on three different “faces” or “masks” (Latin “personae”) to appear to mortals at times as different members of the Godhead. I’ve found that many (most?) everyday Christians who don’t understand the finer theological and philosophical arguments for the Trinitarian creeds are left with a Modalistic view of God. WAS THE BIBLE CHANGED TO SUPPORT TRINITARIAN DOCTRINE? “For there are three that bear record [in heaven, the Father, the Word, and the Holy Ghost: and these three are one. And there are three that bear witness in earth], the Spirit, and the water, and the blood: and these three agree in one. This verse contains some extra words (in bold and brackets above) known to Bible scholars as the “Johannine Comma” (also called the Comma Johanneum) that appear in some early printed editions of the Greek New Testament that were source material for the King James Version. However these extra words are generally absent from the handwritten Greek manuscripts. Although most non-Mormon Christians still cling to the Trinitarian creedal statements that the three members of the godhead are one in “essence” or “nature”, some of them seem to have reached an understanding through Bible study, reason and logic that the members of the godhead are “one” in purpose. This is similar to what Mormons have learned through modern prophetic revelation. Critics of “Mormonism” continually say that the LDS belief in three separate members of the Godhead is “another gospel”, when in fact it is found explicitly taught in John’s gospel, chapter 17. It is the mystical “triune” god that is the product of “another gospel” derived by the Hellenistic philosopher/ theologians over 300 years after the time of Christ. Paul F. Achtemeier, ed. (1985), 1099; emphasis added. R. L. Richard, “Trinity, Holy,” in New Catholic Encyclopedia (New York: McGraw-Hill, 1967), 14:299. (A Critical and Exegetical Commentary on the Gospel According to St. John, International Critical Commentaries [Edinburgh: T & T Clark, 1928]). (The Gospel According to St. John, Tyndale New Testament Commentaries [Grand Rapids: Eerdmans, 1960], 136). Other commentators make similar statements. (Commentary on the Gospel According to John, trans. William Pringle [Grand Rapids: Eerdmans, 1949; orig. 1847], 416). In the immediate post New Testament period of the Apostolic Fathers no attempt was made to work out the God-Christ (Father-Son) relationship in ontological terms. By the end of the fourth century, and owing mainly to the challenge posed by various heresies, theologians went beyond the immediate testimony of the Bible and also beyond liturgical and creedal expressions of Trinitarian faith to the ontological trinity of coequal persons “within” God. The shift is from function to ontology, from the “economic trinity” (Father, Son, and Spirit in relation to us) to the “immanent” or “essential Trinity” (Father, Son, and Spirit in relation to each other). … By the close of the fourth century the orthodox teaching was in place: God is one nature, three persons (mia ousia, treis hupostaseis). The doctrine of the Triune God has had an amazing history. Convinced that this doctrine is a Christian doctrine that did and could originate only from divine revelation, I start the study from the authentic record of divine revelation that is found in the sacred writings of the Old and New Testaments. What does the Old Testament tell us of God? It tells us there is one God, a wonderful God of life and love and righteousness and power and glory and mystery, who is the creator and lord of the whole universe, who is intensely concerned with the tiny people of Israel. It tells us of His Word, Wisdom. Spirit, of the Messiah He will send, of a Son of Man and a Suffering Servant to come. But it tells us nothing explicitly or by necessary implication of a Triune God who is Father, Son and Holy Spirit. If we take the New Testament writers together they tell us there is only one God, the creator and lord of the universe, who is the Father of Jesus. They call Jesus the Son of God, Messiah, Lord, Savior, Word, Wisdom. They assign Him the divine functions of creation, salvation, judgment. Sometimes they call Him God explicitly. They do not speak as fully and clearly of the Holy Spirit as they do of the Son, but at times they coordinate Him with the Father and the Son and put Him on a level with them as far as divinity and personality are concerned. They give us in their writings a triadic ground plan and triadic formulas. They do not speak in abstract terms of nature, substance, person, relation, circumcision, mission, but they present in their own ways the ideas that are behind these terms. They give us no formal or formulated doctrine of the Trinity, no explicit teaching that in one God there are three co-equal divine persons. But they do give us an elemental Trinitarianism, the data from which such a formal doctrine of the Triune God may be formulated. To study the gradual transition from an unformulated Biblical witness to the Father, Son and Holy Spirit to a dogmatic formulation of a doctrine of the Triune God, we look first to the Eastern Church where most of this development took place. The Apostolic Fathers were witnesses to the Biblical data and the traditional faith rather than theologians, but they furnished useful insights into the lines along which the Church’s unconscious theology was developing. Most of them indicated quite clearly a belief in the divinity of Christ, less clearly a belief in the distinct personality and divinity of the Holy Spirit. They gave solid evidence of a belief in three pre-existent ‘beings,’ but they furnished no Trinitarian doctrine, no awareness of a Trinitarian problem. “Question of Continuity and Elemental Trinitarianism: From what has been seen thus far, the impression could arise that the Trinitarian dogma is in the last analysis a late 4th-century invention. In a sense, this is true; but it implies an extremely strict interpretation of the key words Trinitarian and dogma. The formulation “one God in three Persons” was not solidly established, certainly not fully assimilated into Christian life and its profession of faith, prior to the end of the 4th century. But it is precisely this formulation that has first claim to the title the Trinitarian dogma. Among the Apostolic Fathers, there had been nothing even remotely approaching such a mentality or perspective; among the 2d-century Apologists, little more than a focusing of the problem as that of plurality within the unique Godhead. … From the vocabulary and grammar of the Greek original, the intention of the hagiographer to communicate singleness of essence in three distinct Persons was easily derived. … If it is clear on one side that the dogma of the Trinity in the stricter sense of the word was a late arrival, product of 3 centuries’ reflection and debate, it is just as clear on the opposite side that confession of Father, Son, and Holy Spirit-and hence an elemental Trinitarianism-went back to the period of Christian origins. 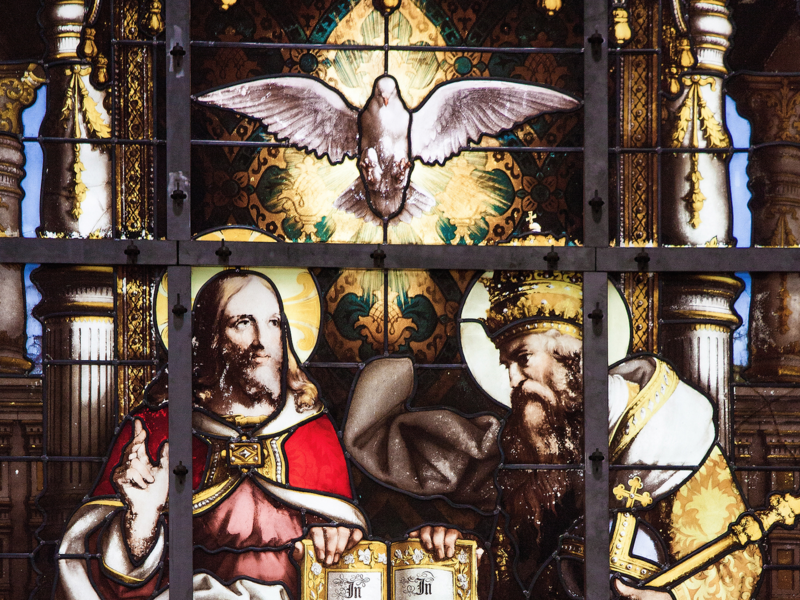 THE DOGMA of the Trinity-The Trinity is the term employed to signify the central doctrine of the Christian religion-the truth that in the unity of the Godhead there are Three Persons the Father the Son, and the Holy Spirit, these three Persons being truly distinct one from another. … In Scripture there is as yet no single term by which the Three Divine Persons are denoted together. The word [tri’as] (of which the Latin trinitas is a translation) is first found in Theophilus of Antioch about A. D. 180. He speaks of “the Trinity of God [the Father], His Word and His Wisdom” (“Ad. Autol.”, 11, 15, P. G., VI, 1078). The term may, of course, have been in use before his time. Shortly afterwards it appears in its Latin form of trinitas in Tertullian. … it has no place in the Liberal Protestantism of today. The writers of this school contend that the doctrine of the Trinity, as professed by the Church, is not contained in the New Testament, but that it was first formulated in the second century and received final approbation in the fourth, as the result of the Arian and Macedonian controversies. “The word Trinity is not found in the Bible, and, though used by Tertullian in the last decade of the 2nd century, it did not find a place formally in the theology of the Church till the 4th century. It was the custom in former times for theologians to blend their own speculations and those of others with the statement of the Bible doctrine. “Because the Trinity is such an important part of later Christian doctrine, it is striking that the term does not appear in the New Testament. Likewise, the developed concept of three coequal partners in the Godhead found in later creedal formulations cannot be clearly detected within the confines of the canon. While there are other New Testament texts where God, Jesus, and the Spirit are referred to in the same passage (e.g., Jude 20-21), it is important to avoid reading the Trinity into places where it does not appear. I find it easiest to just think of them as being able to read each others' minds and hearts just as they can read ours. Bruce R McConkie put it like this: "They are one and dwell in each other, meaning: They have the same mind one with another; they think the same thoughts, speak the same words, and perform the same acts—so much so that any thought, word, or act of one is the thought of the other." In submitting this article to Meridian I neglected to give credit to FairMormon.org, one of my valuable research resources from which I obtained many important quotes. I highly recommend FAIR Mormon to anyone with questions about LDS doctrine or history. That amazing website has a giant collection excellent resources on virtually any Gospel topic, far more than could be included in any one book, or indeed in many volumes.